Kiton sport shirt in check. Kiton sport shirt in mini dot-print. Spread collar; button front. Mitered barrel cuffs. Yoked back shoulders. Shirttail hem. Cotton. Handmade in Italy. Model's measurements: Height, 6'2"/188cm, Suit 40L, Shirt 15.5 (39cm), Waist 32"/81cm, Inseam 34"/86cm. Peter Millar "Fleming" sport shirt in check performance weave. Spread collar; button placket. Barrel cuffs. Patch pocket at left chest. Peter Millar "Fleming" sport shirt in check performance weave. Spread collar; button placket. Barrel cuffs. Patch pocket at left chest. Back yoke. Nylon/spandex. Imported. Model's measurements: Height, 6'1"/185cm, Suit 40L, Shirt 14.5 x 34.5, Waist 32"/81cm, Inseam 32"/81cm. 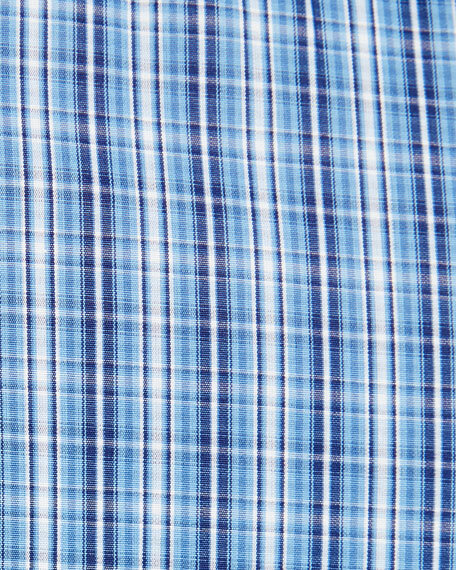 Peter Millar "Mountain Flag" sport shirt in cotton plaid. Button-down collar; button placket. Barrel cuffs. Patch pocket at left chest. Peter Millar "Mountain Flag" sport shirt in cotton plaid. Button-down collar; button placket. Barrel cuffs. Patch pocket at left chest. Imported. Model's measurements: Height, 6'1"/185cm, waist 32"/81cm, suit 40L, shirt 15x34, inseam 32"/81cm. 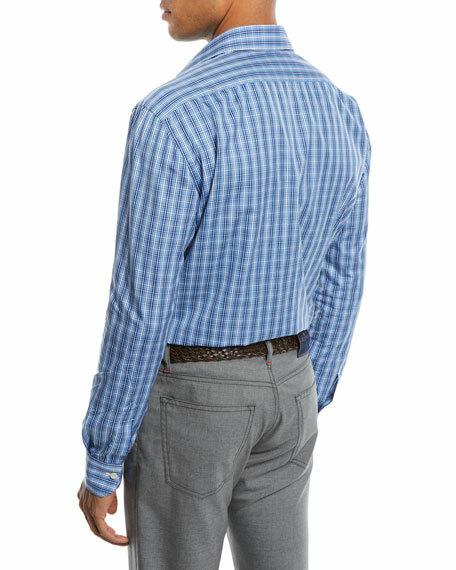 Peter Millar "Portage" sport shirt in woven gingham. Button-down collar; button front. Long sleeves; button cuffs. Chest pocket. Classic fit. 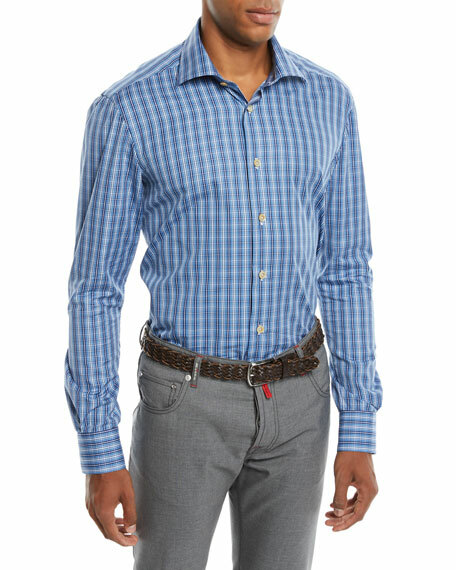 Peter Millar "Portage" sport shirt in woven gingham. Button-down collar; button front. Long sleeves; button cuffs. Chest pocket. Classic fit. Shirttail hem. Cotton. Imported. Model's measurements: Height 6'1"/185cm, waist 32"/81cm, typically wears size M.